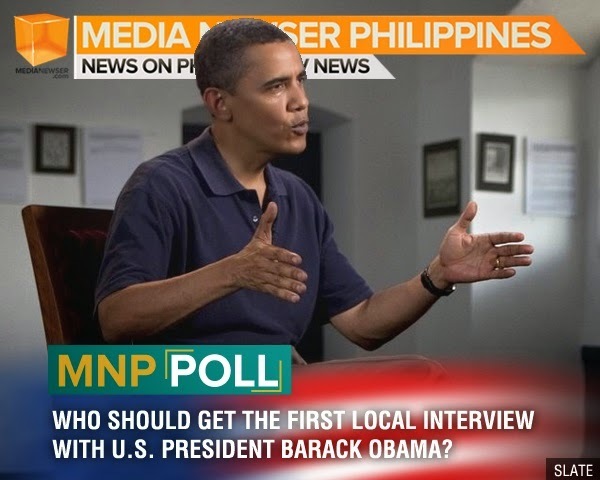 MNP Poll: Who should get the first local interview with U.S. President Barack Obama? Malacañang recently announced that U.S. President Barack Obama will be visiting the country this October 11 to 12, part of his four-country ASEAN trip. "President Obama will meet President Aquino to discuss ways to further strengthen the enduring Philippines-U.S. alliance, including the expansion of our security, economic, and people-to-people ties," said Presidential spokesperson Edwin Lacierda in a statement posted in the Official Gazette. With this history-making event, we're pretty sure our friends in the media will engage (if ever there is) in a fierce booking war to snag a once in a lifetime opportunity to interview Obama. For our brand new MNP Poll, we're asking you this question: Who do you think SHOULD get the first local TV interview with President Obama? Below are some of our choices. You can add yours too below in the comment section or click OTHERS in the voting tab. Ms. Reyes may now be working behind the scenes as the SVP of ABS-CBN News and Current Affairs but we should remember that before moving back to Manila in 2010, she was the network's North America News Bureau Chief. With her experience covering Obama and before him, George Bush, Ms. Reyes is undoubtedly a good choice to sit down with the leader of the free world in a wide-ranging interview. It's no brainer that Ms. Soho is a first-rate interviewer, so she's our top choice among the GMA News pillars to interview Obama. If her sitdown interview with U.S. Deputy Secretary of Defense Ashton Carter in March and her recent one with U.S. Ambassador to the Philippines Harry Thomas Jr. are any indication, Soho will do just fine. With her years of experience anchoring a newscast in the U.S. and a stellar background and knowledge on global affairs, Ms. Celdran will do a great job quizzing Obama on topics concerning our country and America. If they can get this coup, it will be history-making not just for her but also for the growing Solar News. How about the other Celdran? While he's more associated now with a lifestyle/travel show Executive Class, ANC's Director for Current Affairs and TV Production David Celdran is also a good choice considering he's a terrific interviewer. Given that she anchors CNN Konek, Ms. Mercado is well-aware of what's happening in the international scene. Plus, given that she's in a way an underdog in News5, Ms. Mercado will surely do her homework and not waste such a rare opportunity. Who SHOULD get the first local interview with Obama?